Years ago, I discovered the world of blogging and each day I found a new blog that I loved and looked forward to reading. I’m going through the same thing now with podcasts. Podcasts are a bit like blogs come to life. I love listening to the commentators talk each week as I get to know them and their opinions. I learn about the world, collect more books to add to be towering to be read list and laugh. I am not alone in my love of podcasts as a couple of my favorite bloggers have recently written posts about their favorites. Click here to see Modern Mrs. Darcy’s latest favorites or here to see what my friend Katie is listening too. You’ll see some overlap with my list but also quite a few that I haven’t had a chance to check out yet. I have broken my favorites down in to the four categories that are keeping my attention these days; pop culture, grown up books, kids books and cultivating a creative life. Rob picks on me for my lack of pop culture knowledge. I try to deny that I am out of the loop but truth be told, I could be a bit more in the know and pod casts are helping me get there. 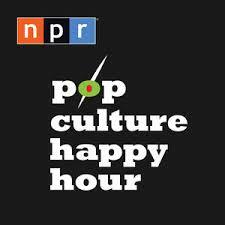 Popculture Happy Hour Popculture Happy Hour is my favorite in this category. There are regular hosts like Linda Holmes, Stephen Thomas and Audie Cornish but many guests as well depending on the topic. In fact, I ‘met’ Margaret H. Willison here which led me to Andrew Cunningham’s Overdue which led me to Willison’s own Appointment Televsion. As you can see, podcasts work a lot like blogs. If you find one good one, that one will lead to you many more. The group tends to cover two main topics but then they end each episodes with a segment called, “Things That Make Me Happy” which tend to make me happy too. The Popcast The Popcast is a weekly podcast, hosted by Knox and Jamie, about all things pop culture. They cover books, movies, tv shows and more. And they are very, funny. Books on the Nightstand Listening to an episode of Books of the Nightstand feels like eavesdropping on two friends. Michael and Ann work in the book industry so they have plenty to say about life in that world and books to love and read asap. 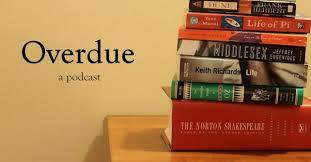 Overdue Overdue describes itself as a podcast about the books you’ve been meaning to read. 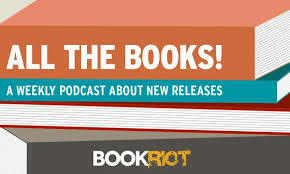 It is different from many other bookish podcasts in that it is not about new releases which is in part refreshing and in part scary as it makes my ‘to be read pile’ even bigger. Book Riot’s All the Books! So All the Books is the opposite of Overdue. Hosts Liberty and Rebecca talk about the week’s releases, what they loved and didn’t and what they plan to read next. The Readers The Readers subtile is ‘book based banter’ and this is totally accurate. To be truthful, I have only listened to a few of these episodes but they are great. The hosts give each other a tough time but you can tell they are great readerly friends. And my to be read list grows each time I listen. 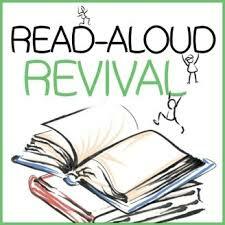 Read Aloud Revival Read Aloud Revival is the first podcast that I followed regular. Sarah Mackenzie’s mission in life is to help families “build a family culture around books”. How awesome is that? Sarah is a home schooler and believes pretty strongly in kids reading lots and lots of classics. Her thoughts on this are quite different than mine but I continue to love her podcast for the big picture beliefs that she supports. 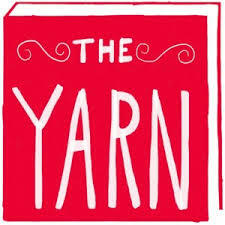 The Yarn So to be totally honest, I have yet to listen to a full episode of The Yarn but it is hosted by two of my most favorite bloggers of all time, Colby Sharp and Travis Jonker, so I am totally sure it will be awesome. In each episode, Colby and Travis look in to the back story of some of their favorite books. I can’t wait to get to know this podcast! 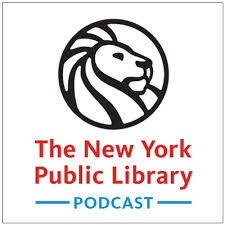 New York Public Library Podcast I have listened to a lot of these episodes but my favorites have been interviews with Cheryl Strayed and Vivien Gornik and the conversation between Elizabeth Gilbert and Ann Patchett. 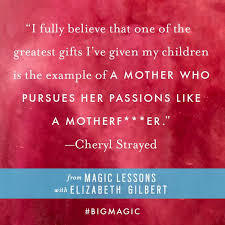 Magic Lessons Elizabeth Gilbert has a new book coming out this fall called Magic Lessons and she was so taken with her topic that she wanted to keep talking about it. The Magic Lesson podcast is a continuation of the work she does in her book as she inspires all of us to follow our creative dreams. So that’s it for now. If you have fallen down the podcast rabbit hole, please let me know what you are loving! What a great resource Stacey! I am really loving podcasts right now, especially ones about books and authors. Ok fine, just those, ha. So now I have more to choose from 🙂 I love the NYPL interviews, Cheryl Strayed’s was awesome as was the great convo between Ann Patchett and Elizabeth Gilbert. I also really like Magic Lessons. Have you heard of Between the Covers? That’s my current favorite. The author interviews are super thoughtful and interesting. I don’t know Between the Covers! I can’t wait to check it out- thanks so much for the recommendation. I love your podcast reco’s Stacey! I’ve been addicted to Pop Culture Happy Hour for a long time now, waiting patiently for Fridays when the new episodes come out, and I even have a T-shirt :-)! Ha! I love that you have a t-shirt! That is the best. I don’t know how it took me so long this podcast- I love it and feel so much more with it! Such a great list! I’m podcast obsessed. I stopped listening to audiobooks because I have too many podcasts in my queue. I’m going to check out Bookriot’s. Thanks! You’ll love all the Book Riot ones- they are super fun. I have really become quite obsessed. Podcasts have taken the place of Netflix time for me which is a good switch. Not sure what will happen when The Affair and Homeland come back on this fall though- the children may have to learn to cook their own meals- ha!! I’ve been hearing so much about podcasts, and didn’t know what to listen to! Thanks for the list. You will love it Allie! You should definitely get hooked before next year’s road trip! I never miss an episode of The Read-Aloud Revival. I love it. I just discovered The Yarn also. I have to admit, I almost didn’t listen to anything after the first episode because I thought the recording and editing was so bad, but thankfully the second episode is much, much better. It’s a really cool idea, and I hope they do more seasons! I also listen to Books on the Nightstand, but the other book podcasts are new to me, so thanks for some new ideas! Good to know about The Yarn. I will keep going if the first one seems off! We are OVER THE MOON to be on this list. Especially since everyone else on it is super smart. We feel we are smart by association. You guys are the best and you are super smart for sure!! I always say you have to be smart to be funny and you guys are funny so there you have it. Keep doing what you’re doing- I love it! Thanks for the recommendations. I just wrote about podcasts and was wondering if there were some good ones that I’d like. Will definitely check these out. Based on our overlapping tastes, I think you will find some to like here Leah!